Several reports on this strange event are posted here, and has already been updated, and will probably be updated several times in the future, as new info comes in. Bugs were the explanation? but is that the question we should be asking? what happened to ... Is there a message present? And if so, does it matter who or what made the 'Symbols'? "I noticed that the seed itself still had the skin or a membrane around it which makes the seed smooth to the touch. So, in fact, you would have to take off this skin or membrane to actually feel the markings or engravings that are in the seed. ...There was no way that a worm or any insect could do that because it would have eaten through the skin or membrane." Photo below is about 50 seeds of approximately 500 seeds found inside an otherwise fresh, healthy yellow banana squash by Salt Lake City restaurant owner, Kasim Barakzia, on March 14. One well known mathematical symbol is the Pi sign in the lower left corner. 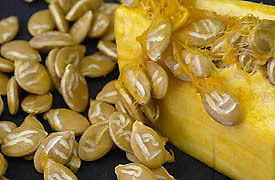 Squash seeds are normally smooth and unmarked. Kasim Barakzia, Owner and Chef, Baba Afghan Restaurant, Salt Lake City, Utah: "When I looked at one of the pieces that had the carvings ­ I thought maybe something is wrong because why is it not plain? It is usually plain, the seeds, smooth and plain. Because a lot of people, they eat these seeds. And that's when I looked at it and it was a little bit different and when I saw some of the signing, I said, 'Don't touch this banana squash.' And from one side, I was busy with lunch and from one side I was running with the reporter. She asked, 'Why did you cut the whole (squash)?' I said, 'I cut the whole thing. I did not know there was some miracle in there because we were doing it for the business. But I cut into (the whole squash). But the one thing ­ I still have it attached with the seeds. That's what I'm saying. If someone is interested, some TV or something, and still need to look at that piece ­ it's still attached for witnessing so they can see it.
" the banana squash was very healthy. It was not a question that worms had got in or something. There was nothing in there." The seeds are marked on both sides. They have a different sign. If one side is English, the other side you can see in a different language. SO BOTH SIDES OF ALL OF THESE SEEDS ARE CARVED AND EACH SIDE IS A DIFFERENT LETTER OR SYMBOL, LIKE AN ENGLISH LETTER AND THEN AN ARABIC LETTER? Right. Or other, either Japanese or other language in there. Could be Roman, could be Vietnamese. I don't know. No one is joking. They cannot prove these type of things (hoaxing). No one ­ when you see these pieces (seeds) by themselves ­ no one can put any of this (in the squash) ­ it is God's gift, whatever is in there." Mr. Barakzia grew up in Afghanistan and is the main cook at the Baba restaurant that he has operated for nine years. Yellow squash is a staple in his restaurant meals. He personally cuts up yellow squash almost daily and is used to seeing the smooth, pale seeds that people like to eat. He calls seeds "pieces" and told me that most of the seeds are engraved on both sides. 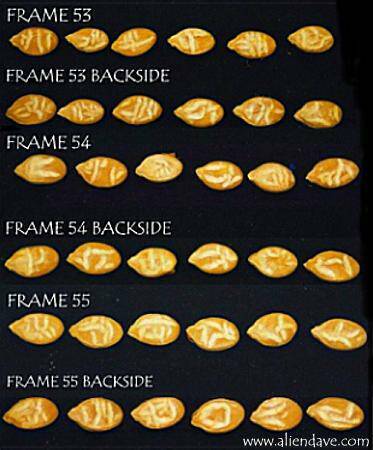 One symbol that he recognized and said is repeated on several seeds is the Arabic symbol for Allah. 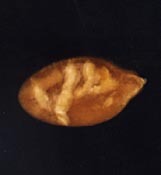 On one of the seeds, the mathematical Pi symbol; <<<<< engraved yellow squash seed from the Baba Afghan Restaurant, Salt Lake City, Utah, found March 14, 2003. Linda M Howe contacted Ryan Layton of UUFOH concerning the Mysterious Squash Seeds found earlier that week. Linda wanted a photographer to document the seeds under her strict scientific criteria, to have sent to, and analysed by a language analyst, in hopes that some meaning or message will come from the many symbols and languages found on the seeds. March 20th, 2003 investigation follow up, photography of the seeds. Upon first hearing of the story, I was quite skeptical and had many doubts about this occurance being anything but some kind of mis identification of insect activity or man made hoax. Boy was I in for a surprise. Armed with a top shelf 35mm camera, tripod and enough film to wallpaper a large room, we entered the restaurant to meet Kasim, the owner and discoverer of the phenomenon. Kasim had already spoke with Linda about our intent and was also wanting to document the seeds on film. Kasim had tried to photograph the seeds himself without success, so our presence was welcomed. Kasim was very protective with the seeds, he explained, " These seeds are some I have not protected, see, they are dry and cracking." He showed several seeds that indeed were in poor shape. " I have called the university to see if someone there knows what I can use to preserve them, I'm waiting for them to call me" He had already set up a black cloth on a small table to lay out the seeds to be photographed,"We can do it here" He said. I explained to him what I needed for light, etc. and how the proccess would go, to keep a conistant shot going and to save time. As we got started, we spoke of the circumstances upon finding the seeds inside the squash. Kasim had all the remaining seeds in numerous vacum packs containing 30 to 40 seeds per pack, which we worked with one pack at a time. He estimated there was 430 seeds in these packages, and a dozen or so seeds on the piece saved with seeds attached. 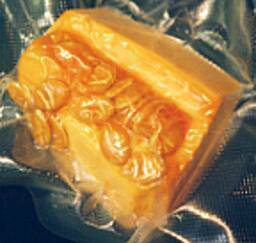 Again to remain inside the vacum pack untouched. It was a good thing he did this, it shows the seeds as he saw them upon opening the squash. Also it proves that they wern't placed inside the squash by some means 'unknown'. seeing this, one is convinced this is a phenomenon that has no easy answer. A miracle? well it certainly wasn't worms or insects. I finished setting up and we started photographing the seeds six at a time, laid end to end, with a marker label in the shot for reference and ID, then turning the seeds over to photograph the opposite side, with it having its own marker/ label. As this steady, carefull, labeling and documenting continued, I was more and more amazed with the symbols that were appearing. While trying to be as quick as possible to keep the seeds exposed to the air as little time possible. As you can see from the photos, the difference in color , etc. the seeds have been out in the open for approx. 36hrs before Kasim realized they needed protection, to keep them fresh and in good condition, It was a smart move to vacum pack them, The packs were also kept on ice while we were there. They would eventually be placed back into a refrigerator at Kasim's home. The documentation was moving along, Then I noticed something.... the seeds had a covering, a skin or membrane covering the seed. The seeds were smooth! The markings were under this skin,............. I was floored! How could this be produced? and why didn't I notice this right away? Probably because my mind was on getting quality photos and the protective nature of Kasim regarding the seeds. It might be also that I was so impressed with the detail and artlike quality of the markings, or maybe the sheer number of seeds. But the fact was, these seeds were a real X file! Now I was really having a hard time concentrating on the work at hand. Something was certainly very strange about these seeds. I wondered what would happen if some were planted and given time to produce 'offspring' squash. My personal opinion is, no human hand had any part of creating this, this, event, phenomenon, sign, or? - Insects or worms are ruled out easily. The seeds edges are not affected, nor are there any seeds with holes or deep marks. No insects were found inside the squash. - The markings are of a consistant depth in relation to each other. - The markings seem to be centered on the seed. - The seeds have a natural membrane or skin covering that is above the markings. making it almost certainly impossible to hoax. - It would take a person hundreds of hours to hand carve the number of seeds discovered. with such detail, and in several different languages. - The squash was healthy and ready for consumption. - The squash was grown in Mexico, and shipped to Utah. - The squash showed no signs of tamperment or anything that would conclude it was unusual from the outside. I would like to thank Kasim for the opportunity to inspect the seeds and photograph them all for study. I also want to say that if we don't have an open mind to occurances like this, they will be overlooked or passed over as a simple fluke. or what other label you want to place on it. Only after carefull inspection, by several sources are the high strangeness factors noticed. And the real facts proving its unlikely a man made event. I wonder how many people read the story in the SLC Tribune and took it as tabloidish, watercooler news or work of a trickster. Hmmm.... reminds me of another subject that is viewed by the masses the same way. And reported in the same tight leashed, censored, hokey ha ha mass media norm. We await the results from Linda M Howe and her associate. and will UPDATE as soon as we recieve results or confirmation. Also MORE Photos of the seeds taken by Dave Rosenfeld are on www.earthfiles.com with Linda's updated report. Photo above is the piece of the squash Kasim saved with the seeds clearly attached, he didnt consent to removing the piece from its vacum pack. Understandably concerned about the preservation of this piece. Regarding the Salt Lake City Squash "carvings," even though this may seem miraculous at the moment there may still prove to be some natural process that has brought about this result. As with a lot of UFO stories you cannot be certain that what appears to be is actually the correct assessment of the circumstances. Here are some of the things to question in this case: ALL the seeds are marked on BOTH sides the markings can be interpreted as signs and symbols, but they could also be the result of a fairly random process that affected the seeds during the squash's growth. I note that one of the seeds has just one mark on it. Would that indicate that there are some marked seeds that have no significance or meaning? fairly consistent orientation when the seeds are aligned in relation to one another in order to arrange intelligible sets of symbols such as would be read from a page. So when the "letter/symbols" are grouped do all the pointed seed tips point up, to the right, or some other direction? A human intelligence will be arranging the seeds and interpreting their markings, but if the markings are more random than deliberate then the points on the seeds will probably NOT all point in the same direction. Is there really a correlation between the markings on one side of the seed and the markings on the other? It would be quite remarkable, if that proved true for all seeds. The fact that some of the seeds seemed to have unrecognizable symbols according to the chef should be a warning that the markings and their meanings are subject to certain human preconceptions and an overly narrow interpretation of their purpose and meaning. 'nough said... May you continue to live in interresting times. On left, close-up banana squash seed "engraved"
with Arabic symbol for "Allah." I was surprised to see that the thin, transparent membrane surrounding each seed was still intact. Dave Rosenfeld, Photographer and Director of the Utah UFO Hunters, Salt Lake City, Utah: "I was skeptical when I went to photograph. When Kasim (Barakzia) pulled out the seeds, they were all in vacuum packs, 30 to 40 seeds per pack, and he did not want them to leave his sight, that's for sure. He was pretty protective of them. When he pulled them out and I started inspecting them, just the symbols at first ­ looking at the different shapes of the symbols. I noticed that the seed itself still had the skin or a membrane around it which makes the seed smooth to the touch. So, in fact, you would have to take off this skin or membrane to actually feel the markings or engravings that are in the seed. After seeing the seeds up close and seeing the membrane was still on the seeds intact, I was quite floored! WHAT YOU ARE SAYING IS THAT WHATEVER THIS ENGRAVING PROCESS WAS, IT WAS BENEATH A TRANSLUCENT OR TRANSPARENT SKIN SURROUNDING THE SEEDS? Correct. There was no way that a worm or any insect could do that because it would have eaten through the skin or membrane. DID YOU SEE THIS TRANSPARENT COVERING ON EVERY ONE OF THE SEEDS? Yes, and even on the dry seeds he had, the ones that were really dry and cracking apart ­ that's where you could really see the membrane as it was flaking off the seed. THAT MAKES THIS EVEN MORE REMARKABLE BECAUSE HOW WERE THESE SYMBOLS ENGRAVED THROUGH THE TRANSPARENT COVERING OF THE SEEDS WITHOUT LEAVING A MARK IN THE COVERING? Talking with Kasim, he says that he has been cutting open squash for 9 years and he says that sometimes he gets squash from different locations. This squash was from Mexico and he said if someone was to fake this, hoax this, if there is some way to do this, they would have to do it when the squash was quite young in order for it to heal over after placing the (carved) seeds back in there. HOW COULD ANYBODY OPEN UP A SQUASH, CARVE 500 SEEDS AND PUT THEM BACK INTO THE SQUASH WITHOUT IT BEING QUITE OBVIOUS? Yes, that's what Kasim has been saying, too. He has never seen anything like it. And he personally cut open that squash, so he knew that it wasn't pieced together."